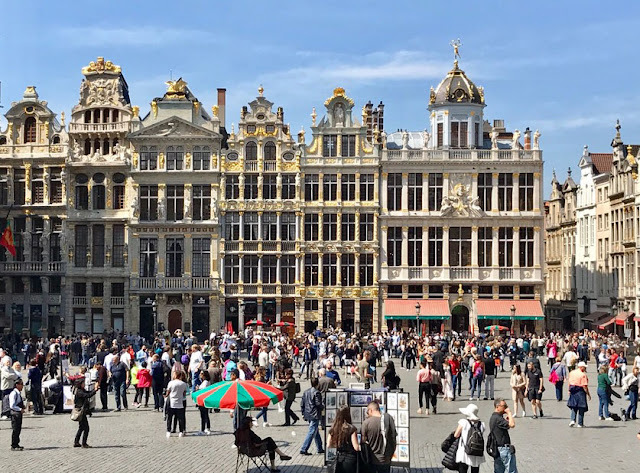 Brussels is a city that everyone has heard about because it is Europe's administrative center, but few are those who know something more about it and even fewer those who would put it on the list of their next destinations! I also belong to this category, or I probably belonged until April 2013, when I visited Brussels for the first time. And the reason I decided to make this trip was not even what I had heard about Brussels (I had heard nothing! ), Nor its famous and well-known attractions (there are not many of them). It was just the very cheap airfares combined with my general belief that every part of the world you visit, however small or indifferent it may seems, leaves a sign to your soul. I know you have Brussels in your mind, like a cold, gray and dull city. Indeed, it is colder than Athens, more gray than Barcelona and more boring than London. But there is much more ... It is a multinational city, a friendly city, alive and at the same time calm, as its people are. A city that smells chocolate and freshly baked waffle in every corner, a city with one of Europe's tastiest cuisines! And if I have not yet convinced you that it is worth giving Brussels a chance, or if I have done it, it is time to tell you what it is worth seeing while you are there. The central square of the city is at the same time its biggest attraction, and I dare say one of the most beautiful squares I've ever seen in my life. Surrounded by imposing buildings, the most impressive of which is the Brussels Town Hall, which stands out from its Gothic tower, which is almost 100 meters high. There is also there the famous Maison du Cygne, with the stunning views, where Marx used to drink his coffee. The next largest and at the same time the tiniest attraction in Brussels is the Manneken Pis. It is a bronze statue that represents a boy to pee, and is in the same place since 1619! Now the statue has its feminine version, Jeanneke Pis but also the dog, Het Zinneke, all located in different parts of the city. The Belgians take their comic book history very seriously, and they call it ninth art. While they have an entire museum, the Center Belge de la Bande Dessinée dedicated to these and it is perfectly reasonable since Lucky Luke, Smurfs and Tin-Tin were born here. There is no need to go to this particular museum to see Tin-Tin since you can meet him in the frescoes around the city, such as Gare du Midi Station and Stockel Metro Station. Altogether, there are more than 40 frescoes with famous comic characters in Brussels, with the most famous of course being Tin-Tin. There is no way to visit a city and not go through at least one local market. If you happen to be in Brussels on Sunday, you have to take a stroll up to the Gare du Midi. Multiculturalism in all its grandeur. Colorful stalls, and people from all over the world, spices from Africa, olives from Spain, cheeses from France, food from Morocco. It is the largest outdoor market in the world where you can find clothes and home supplies up to flowers, fruits and food from any part of the world you can imagine. Did you know that Belgium has a king? The royal palace of Brussels, located in the center of the city in front of the Brussels Park, is the official palace of the King and Queen of the Belgians, but they no longer reside in it, but in the Laeken castle, just outside the Brussels. It was originally built to be used as a castle at the end of the 11th century, but it became a palace along the way, and since 1900 it has the form we see to this day. The Mont des Arts, or the hill of the arts, is a garden surrounded by various museums such as the Musée des Musées, the Center de Fine Arts Bozar and the Musée Magritte. It was in the late 19th century when King Leopold II wanted to beautifully siding his palace. It is the place that offers the best views of the city of Brussels, from where you can see the tower of the town hall at Grand Place, the statue of King Albert II, and the Sacred Heart Basilica with its green dome. Cathedral of St. Michael and St. Gudula has been the central cathedral of the city since 1962. The temple is Gothic style with impressive statues, while its windows are decorated with beautiful stained glass. The temple is built on a Roman chapel of the 11th century, the ruins of which are visible from the crypt of the temple. All royal weddings take place here, as well as many concerts throughout the year. The Parc du Cinquantenaire (50th Anniversary Park) is a large park in the European Quarter, centered around the 50-year-old arch designed for the 1880 National Exhibition to commemorate Belgium's 50th anniversary. Around the park are three museums, the Royal Museums of the Armed Forces, the Royal Museums of Art and History and AutoWorld, as well as a mosque. Galeries Royales Saint-Hubert, with its impressive glass dome, is the world's first shopping mall. It was built in 1847 and possibly inspired other commercial galleries such as the Galleria Vittorio Emanuele II in Milan. May the shops here be more expensive than what you will find elsewhere in Brussels, but it is worth visiting at least one of those who sell chocolates. Belgian cuisine is one of my favorites so I have to present it to you in a separate post. I will tell you here in a few words, however, what is necessary to taste as long as you are in Brussels. First of all chocolates. It is no coincidence that Belgium is world-famous for its chocolates. On your walks in the city you will find many shops produce and selling chocolates. Comptoir de Mathilde, Neuhaus and Pierre Marcolini are some of the bests. In addition to their chocolate, the Belgians are also famous for the best waffles in the world! What waffle though? Brussels Waffle and waffle Liège? I prefer the second one (but you have to eat both to get to your own favorite). Maison Dandoy and the Waffle Factory are my favorite waffle shops in Brussels. Another reason why Belgium is famous is french fries. And you will tell me, okay fries are fries, what' s different about them? And yet they are! They are fried in meat fat and combined with many different sauces. The best fried potatoes are served at Maison Antoine and Fritland. And finally the beers. What to say about belgian beers ... You may have heard much more about German or Czech ones, but Belgium is the country with the more beer varieties in the world (about 300), while in this small country exist 8,700 beer brands! More than 2000 of these brands can be tasted at Delirium TapHouse.